Learnings from an experiment in next generation news. Imagine magically receiving the nearest news to you now on your mobile phone, without the need to download an app. That's OtherWorld. Our experiment in location-based, real-time storytelling took place in Manchester in 2017. It would test our vision for what news could look like in 2020, based on our idea of 'Living Media'. Fluid news serving the fluid communities of tomorrow. OtherWorld uses beacon technology to create a powerful and highly responsive news ecosystem. It can also operate free from search engines, social media, advertising or even a news homepage. Most importantly, it's proof of concept for a new news experience for the generation of people who will never buy their local newspaper. People like you and I.
OtherWorld used the very latest beacon technology to create magical location-based storytelling experiences, helping people to explore the world around them like never before. For free and without the need for an app. Behind that simple proposition sat Google Eddystone and the Physical Web - a Google trial where beacons broadcast their URLs to the Chrome browser. Setting it up was easy and you only needed to do it once. Beacon signals are sent via Bluetooth. These days 75% of us (40% UK) already have it switched on thanks to the rise of Bluetooth wearables and for hands-free calling and music streaming in our cars. It also no longer drains our mobile phone batteries. This is where iPhones and Android handsets differed. On a mobile phone running on Android OS the process was simple. Make sure Location was switched 'on' and that should be enough. If not, go to Settings > Google > Nearby. If it's switched 'off', turn it 'on'. Older devices would need to enable the Physical Web in Chrome (more on that below). Hey presto! Any stories you walked by appeared as a silent notification on your phone's homescreen. When you walked out of range (typically ~100 metres) they fell away. If you clicked on the story it would open up on Chrome. OtherWorld's network of beacons were strategically positioned in key hotspots across Manchester city centre, giving maximum coverage on a manageable human scale. The would tell the stories of a diverse mix of neighbourhoods (via their commuter thoroughfares, public squares, cultural quarters and mixed-use developments) supported by clusters of nearby content partners. These partners would come in all shapes and sizes, and would have their own set of reasons for getting involved in the pilot. We explore some of these below. OtherWorld could react quickly to any breaking news and broadcast police appeals close to where an incident has happened. We could also target consultations to a particular community of interest. The added relevance offered by proximity means these are always popular stories and we try to include a call to action whenever possible to assist the police with their inquiries. With two beacons at the heart of the mixed-use Spinningfields development, this was our best performing location. This popularity was due to 27/4 activity on the estate including periods of significant dwell time and a proactive partner who regularly promoted OtherWorld. In return, tenants and their customers would receive a daily briefing consisting of local news, upcoming events and the evolution of the estate. We positioned beacons in public squares to amplify public service announcements and promote opportunities for residents to shape their city. This could be inviting applications to a new community fund, getting more people involved in the planning process, sharing events at the library or engaging residents who might be otherwise hard to reach. NOMA is a £800 million, 20-acre mixed-use redevelopment scheme near Victoria Station. Its anchor tenant (and part-owner) is the Co-operative. The beacon was next to a community workshop, pub and public square at the heart of the future development, helping to create a sense of place for an up-and-coming area and create links with the neighbouring medieval quarter and The Printworks. Our relationship with Manchester’s annual LGBT celebration was arranged via Manchester Evening News. We would amplify their coverage and teleport it to key points of the parade. In addition to deploying and co-ordinating our existing beacons, we would arm their on-duty reporter with their own beacon, enabling them to become a roaming digital broadcaster. Fiercely independent and never standing still, the Northern Quarter is a hive of activity. Beacons would broadcast from either end of Thomas Street, acting as a gateway for the many side streets that run off it. Performance peaked in evenings and at weekends as our beacons often found themselves perfectly positioned to talk to people queuing to enter a bar or perusing a pop-up street market. Our fundamental promise to all partners is that OtherWorld doesn’t create any additional work for them. OtherWorld simply repurposes and repackages the stories they’re already sitting on, ready to be discovered by new audiences on the go. Despite being relatively emerging technology there's plenty of free resources and low-cost beacon hardware to start prototyping with. For less than $100 you can build your own dynamic news ecosystem and have it broadcasting in less than an hour. It's just one of the many reasons why we believe that the world doesn't need yet another news app! 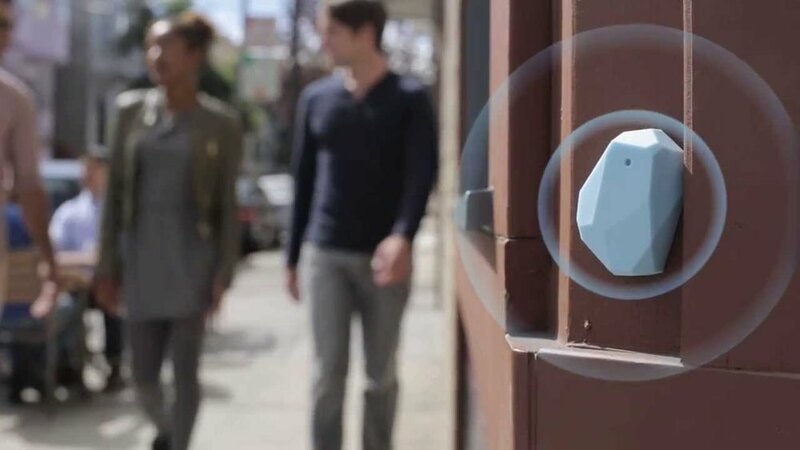 After considering all the options, we opted for Estimote Location Beacons. Whilst original built for indoor mapping, they offered several advantages over the alternatives. This included: water and weather resistance; the ability to broadcast multiple packets simultaneously; customisation within the Eddystone protocol; ~3 year battery life, and; a broadcast range of up to 200 meters. You can purchase a development kit for $99. Each beacon has a Bluetooth® Low Energy transmitter. It broadcasts tiny radio signals over the air containing unique, location-specific data. Modern smartphones constantly scan for these signals. If the handset enters their range they display a silent notification or trigger an app intent. This relatively simple exchange turned out to be an extremely powerful storytelling tool. Here & Now by Estimote enables you to remotely programme messages and links from their web panel. This comes with a few compromises, including an override of your favicon or preview image in favour of the Estimote cloud logo and the serving of their default domain instead of your branded URL. However, it's perfect for the initial testing of your idea. Google's free-of-charge Beacon Dashboard is another way to easily manage a fleet of beacons registered via the Beacon Tools app. The dashboard helps you make live adjustments to beacons, including attachments for Nearby notification messages, beacon properties and their current locations. To manage beacons at scale we would recommend using the Proximity Beacon API. The Proximity Beacon API is a cloud service that allows you to manage data associated with your BLE beacons using a REST interface. You can remotely update attachments and monitor your beacons, eliminating the need to visit them in person. Get started. The pilot also presented an opportunity to look at various newsroom functions with fresh eyes. The tools below helped us to engineer series of automations in order to streamline editorial processes, including story submissions, scheduling and editorial community management. We also tapped into the development community to explore ways to guarantee a more reliable and scalable service beyond the pilot. Within the big OtherWorld experiment are lots and lots of smaller experiments. For example, existing news gathering processes can be difficult to navigate for sources and give journalists inbox fatigue, meaning the potentially good stories are lost in a mountain of emails. Our answer was to let users simply submit a link to a story, which would then automatically be scheduled for consideration in Trello. No more emails. So no need for an editorial inbox at all! Our early research identified a group of people who wanted to play a role in helping to shape the future of news in Manchester. In response, we created an open editorial community on Slack. Joining the Slack group was free and gave an insight into the inner workings of the project and an opportunity to ask questions. It was an experiment within an experiment, with some success. Nothing ventured, nothing gained. GitHub helped to navigate workarounds to issues and is a great resource when exploring APIs. APIs are the best way to mange fleets of beacons at scale, replacing what can be a very manual process. They also promise: greater customisation of alert content; the ability to detect and assign the nearest beacon to a story based on geo-tags; pulling in news feeds from trusted sources; and a degree of personalisation to the reader. Our marketing strategy for the pilot was twofold: create highly targeted real-world prompts in our storytelling locations and enlist content partners as our wider marketing department. The support of our partners gave us instant traction, as they kindly made their customers, tenants and fans aware of OtherWorld and encouraged them to activate their phones for the service. This approach also turned out to be extremely resourceful, as marketing accounted for 10% of our total budget, including design, printing and media spend. Like No Other is the future-led consultancy practice and start-up studio of Stuart Goulden. As marketing, culture and change specialists, we collaborate with companies looking to transform themselves and the world around them, for good. Stuart Goulden is an award-winning writer and serial entrepreneur working from the North of England. The Digital News Initiative (DNI) is a $150m collaboration between Google and news publishers across Europe to support high quality journalism and encourage a more sustainable news ecosystem through technology and innovation. OtherWorld put our concept of ‘living media’ to the test and, in turn, piloted a radically different news ecosystem for our future cities. This centred on providing an accompanying real-world experience to digital news that could open up exciting new storytelling possibilities for newsrooms and engage a new generation of people in local news. So, having demonstrated its potential, what did we learn along the way? It’s no secret that people have a love/hate relationship with news. This extends to UX, where good stories are lost amongst a sea of disposable content and bad design. OtherWorld stripped back a lot of this clutter, beaming stories directly to where they happened and presenting them without distraction. We discovered that people valued this geographical relevance over anything else and appreciated a reading experience focused on simplicity and action. It also became very clear that our partners wanted a way to convert passing footfall. OtherWorld allowed them to speak to passersby and opened up a new revenue stream for media owners. Trialing anything new is always a bit of a leap in the dark. There's no instruction manual to fall back on when testing new media habits. Perhaps the biggest surprise was the range of possible new revenue streams beyond advertising. As an emerging technology and protocol there was very little up-to-date documentation available. Although some difficulties were anticipated, the unpredictability and frequent iterations of the underlying technology meant a lot of trial and error to diagnose and resolve problems. Often if we were experiencing a new issue, it soon materialised that everybody else was too. Our pilot was built on top of Physical Web - a Google trial where beacons broadcast their URLs to the Chrome browser. It was a revelation in receiving beacon-based local information without the need for an app. In an unexpected move, Google abandoned Physical Web in November 2017, meaning Physical Web scanning was no longer possible in the revamped iOS Widget. Android phones can still surface our notifications via Nearby Notifications, albeit with range reduced from approximately 100 metres to 30 metres. Of course, this could change again at any time and is the risk inherent in any prototype project. Thanks to Google's open BLE beacon format, Eddystone, and the falling cost of hardware, more magical news experiences could be just around the corner. Those brave enough to think differently about news distribution and discovery - beyond websites, apps and social media - will reap the rewards. The power of location-based storytelling is also now clear. If you consider roll-out could see a city deploy hundreds of beacons, each carrying multiple stories a day, our promising early results give an exciting indication of the surge of readers an OtherWorld-style news ecosystem could generate. The OtherWorld pilot aimed to offer equal part provocation and inspiration for the sector. We hope it's fulfilled that promise. We've only scratched the surface of the storytelling and civic engagement possibilities presented by beacons and wish to encourage others to join us in rethinking tired digital news conventions. It's clear that if news organisations don't embrace the opportunity, others will. With the short pilot now complete, we're also taking some time to consider what's next for OtherWorld. The prototype for a radically different breed of local news has opened lots of new doors and we're keen to explore them properly.